James Hautman of Chaska, Minn., earned top honors again in the annual Federal Duck Stamp Art Contest with his painting of two Greater White-fronted Geese. The judging and announcement took place Saturday at the David Brower Center in Berkeley, Calif.
Hautman's work bested more than 230 entries and will appear as the 2011-12 Migratory Bird Hunting and Conservation Stamp. He previously won the contest in 1989, 1994 and 1998. The Duck Stamp sells for $15 and raises close to $25 million each year to provide funds that purchase wetlands and grasslands providing habitat for waterfowl and many species enjoyed by birders and other outdoor enthusiasts. Ninety-eight percent of the proceeds go to the Migratory Bird Conservation Fund. 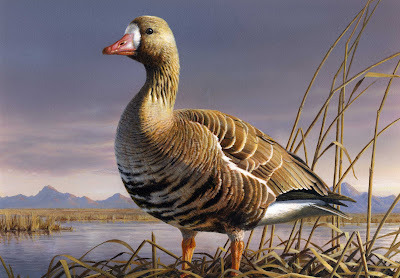 Hautman's brother Robert of Delano, Minn., earned second place in the contest with his painting of a Greater White-fronted Goose. 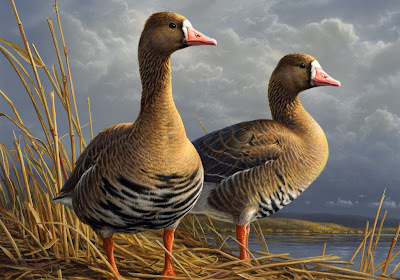 Robert Hautman won first place in two previous Duck Stamp art contests. 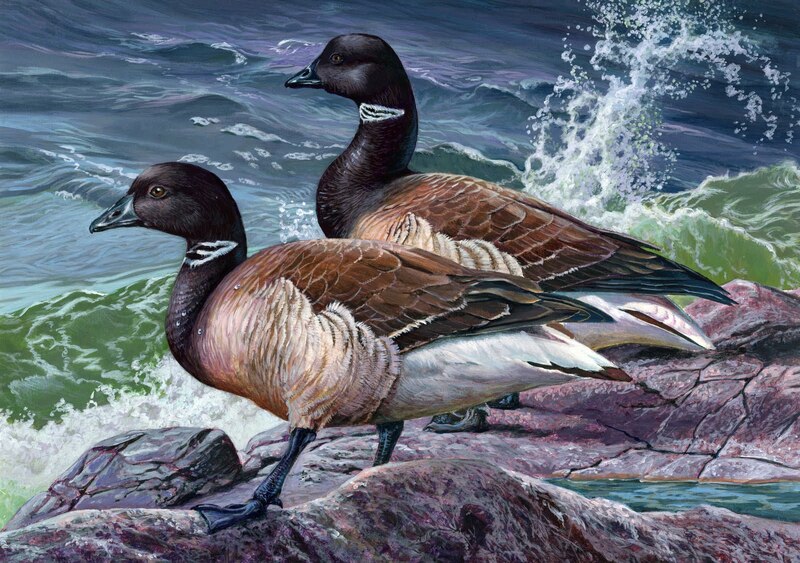 An acrylic painting of two Brant earned third-place honors for Kip Richmond of Apex, N.C. Eligible species for this year’s Federal Duck Stamp Contest were Brant, Canada Goose, Greater White-fronted Goose, Northern Shoveler and Ruddy Duck. The judges included former California Secretary of Natural Resources Mike Chrisman; waterfowl biologist and professor John Eadie; wildlife artist Joe Garcia; retired U.S. Fish and Wildlife Service biologist Jerry Serie; and wildlife biologist and duck stamp expert Carlo Vecchiarelli. The alternate judge was Gary Kramer, an outdoor writer and photographer -- and WildBird contributor.